It's been many moons since I've shared a poem for Poetry Friday, so I've been saving this book. 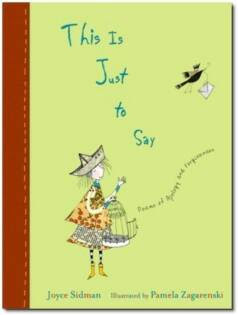 Written by Joyce Sidman and illustrated by Pamela Zagarenski, this book holds delights on every single page. It has the two characteristics that the best of children's literature always exemplifies - compelling text that can be understood on many levels with charming illustrations that amplify the text and entertain over multiple readings. Inspired by the poem of the same name by William Carolos Williams, Mrs. Mertz has her sixth graders write poems of apology as part of their poetry unit. The book is divided into two parts. First come the poems of apology. They are then followed by the responses. Each pair of poems reveal a relationship between one of the student's and someone else. Stolen jelly doughnuts, unrequited love, and failing in the spelling bee are just a few of the topics that are turned into lovely and delicious poems. The apology and its response echo together much like traditional call and response songs. The effect is both bittersweet and affirming as we delve below the surface of Mrs. Mertz's sixth graders and their emerging selves. I highly recommend this book. It's charming, sweet and invites the reader to linger and savor the emotional landscape. Before I share sample poem, Poetry Friday is being hosted at Read, Imagine, Talk today. Head on over to find more terrific poems to celebrate Poetry Friday. Here's your poem! a wafting wave of chocolate-ness. ears pricked like a bat's. I slashed a huge chunk right out of the middle. winked at me as I gobbled them. But my stomach said, Heavenly! And a nice take on using the WCW poem as a starting point! HI, Kelly - thanks for stopping by. The first poem in the book follows the WCW poem closely except instead of eating all the plums in the icebox, the 6th grade poet stole all the jelly doughnuts form the teachers' lounge!